Here’s a shout out to readers of the Concussion Blog who have found their way here. 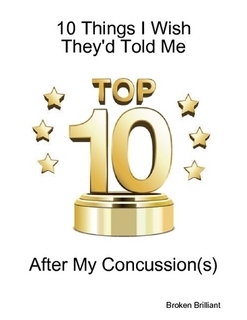 And if you haven’t checked out the Concussion Blog yet, please do. It’s great. Anyway, about a year ago, I started getting into reading about concussions more seriously and thinking about them in terms of not only my own experience, but also that of many other student athletes who have experienced concussion. I got Chris Nowinski’s book Head Games, and I read that (and got very concerned about the idea of getting knocked around again), and did some more thinking. Basically, I’ve seen two trains of thought around concussion — one treating it as concussion, the other treating it as brain/head injury. Which highlights one of the core issues for me — concussion can be more easily dismissed (as I once did) if it’s not viewed in terms of being a traumatic brain injury. It may also be more easily studied, however — googling “long-term sequelae of head injury” returns 857 results, while googling “long-term sequelae of concussion” returns 279,000 results. Interesting disparity there. So, there’s more talk about concussion… perhaps because it’s a “safer” word. But is that safety costing us, in terms of seriousness? Calling something a nicer word may make everyone feel better, but is that we should really be doing? Granted, upping the volume on concussion concern and awareness can introduce a certain paranoia to the discussion, and without the proper context and a level-headed approach, it can degenerate to knee-jerk “Stop all play now!” kinds of frantic reactions. But we also need to be adults about this and accept that concussion isn’t just about being “violently shaken” — it’s about the brain. And that’s not the sort of thing it pays to dismiss. It will take about three years for the reactionary tone around the concussion crisis to give way to level-headed, medically and scientifically sound and experience-based discussions and responses. It will happen, but it’s not going to happen overnight. First, we need to get our heads around the potential severity of the situation, learn as much as we can about what can be done to prevent and respond and adjust, and create a culture that can protect its active members both during and after play. I give us all five years to come up with an actual plan of action that’s been shown to work. But let’s not wait five years. Let’s start now. A simple way to look at this is that concussion is that act of the injury – brain injury is the result. Traumatic brain injury usually means some lasting result of a concussion. All TBI folks have been concussed (unless it was anoxia or something like that). A concussion leads to suspect TBI is the symptoms are there but all concussions DO NOT lead to brain injury. Ah, thanks for the clarification – that really helps. I have to wonder, however, if concussion isn’t a TBI that heals. I know it’s ‘wrong’ to say that brain injuries heal, but from where I’m sitting, it seems like concussion is to TBI what a bone fracture is to a break. They are both instances of injury, but perhaps matters of degree?